JAKARTA, Indonesia (CNS) — More than 90,000 police and soldiers and a moderate Muslim youth group will help guard nearly 50,000 churches across Indonesia, including some previously attacked by terrorists, during the Christmas period. Brig. 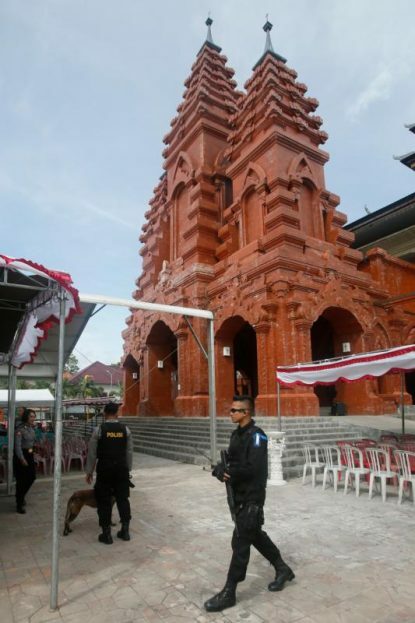 Gen Dedi Prasetyo, national police spokesman, said Christmas security this year will be focused on churches in 13 provinces, including on the main islands of Java and Sumatra, reported ucanews.com. The deployments would be to “anticipate” possible security threats, Prasetyo added. Francis Xavier Ping Tedja, security coordinator at Santa Maria Church, said about 70 police, military and members of Banser — a military youth group associated with Nahdlatul Ulama, the biggest moderate Muslim organization in Indonesia — will secure the church for Christmas. “We have coordinated with police, military, and Islamic groups to maintain the security, so that Catholics can attend Christmas Masses comfortably and safely,” he told ucanews.com Dec. 17. In order to simplify police work, Catholics have been asked to not bring bags when they attend Christmas Masses. “We hope Catholics will not be afraid to attend Christmas Masses at the church,” he said. Father Antonius Suyadi, chairman of the Jakarta Archdiocese’s Ecumenical and Interreligious Affairs Commission, said Christmas celebrations at the cathedral will be guarded by about 300 police and military personnel. “Besides the cathedral church, police and military forces will also guard other Catholic churches in the archdiocese,” said Father Suyadi. Indonesia’s anti-terror squad arrested two terrorist suspects in Yogyakarta Dec. 11; the suspects allegedly planned to attack during Christmas and New Year celebrations. Police did not elaborate their targeted facilities or locations.